Though many of Southern California’s current residents are sadly ignorant of the fact, aerospace and the SoCal region are inseparable. Burbank, Downey, Santa Monica, Long Beach, Palmdale, Santa Ana, Irvine… this is where it all happened. All of it, going right back to the very beginnings of aviation itself. It was less than six years after Kitty Hawk that Glenn Martin was flying over the Irvine Ranch in south Orange County. Three years later he made the world’s longest overwater flight — Newport Beach to Catalina — in a plane he built in a Santa Ana church basement. During World War II, Douglas Aircraft Company had 150,000 workers at their Long Beach plant rolling out a new airplane every two hours. Incidentally, today Boeing turns out a grand total of one aircraft per month at that same facility. Douglas also produced incredible numbers at their Santa Monica plant. 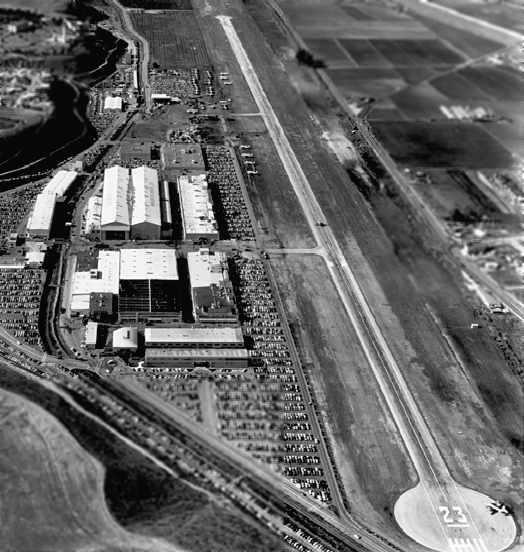 Likewise, Lockheed had a virtual city at the Burbank Airport and the Hughes Aircraft Co. operated out of their airport in Culver City. Even among those familiar with SoCal history, few are aware that Vultee fulfilled the Army Air Corp’s largest orders (nearly 12,000 aircraft during the war) at their massive factory in Downey. 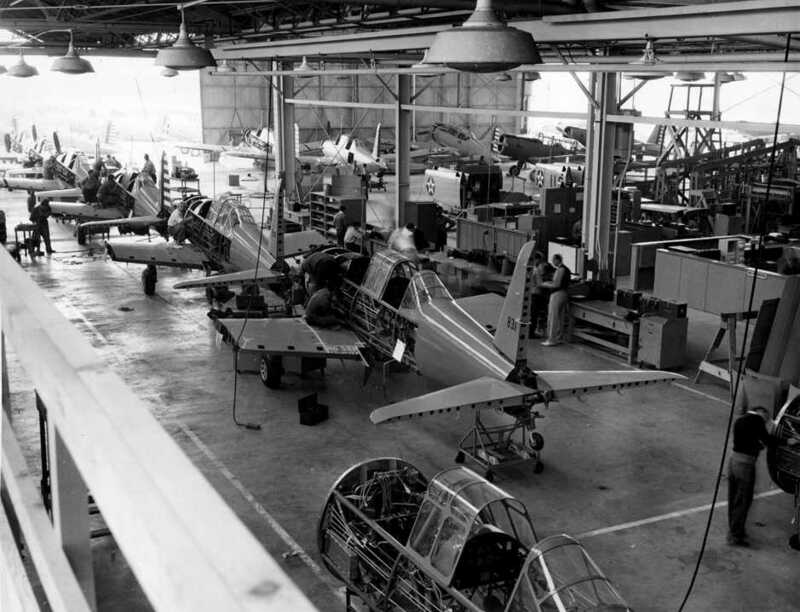 The Hughes Aircraft plant in it’s heyday. Among the cluster of buildings is one that still stands today: a hangar where Hughes’ office was located and the H-1 Hercules — aka the Spruce Goose — was built. Speaking of Downey, that facility has quite a pedigree. Cruise missile technology was first developed there in the form of the AGM-28 “Hound Dog”. The X-15 was designed and built there as well. At the height of the Cold War, Apollo spacecraft were constructed in Downey by North American / Rockwell. Later on the space shuttles would be fabricated at that same plant and then shipped to Palmdale for final assembly and rollout. There are countless other examples. Northrop built 747 fuselages at the Hawthorne Airport and B-2 Stealth bombers in Pico Rivera. Ryan Aeronautical turned out Navions and PT-22s by the thousand. Satellites and payloads were created and tested around the region. Even today Robinson Helicopter, the world’s largest rotorcraft manufacturer, is based at the Torrance Airport. The C-17 is built in Long Beach, and nearly half of the F-18 Hornet’s components are made in SoCal. Also, the F-35 Joint Strike Fighter’s fuselage is built in Palmdale and El Segundo. Still, the trend has been negative for decades, and many industry observers have been waiting for the final shoe to drop on aerospace activity in SoCal. But the strangest thing seems to be happening. 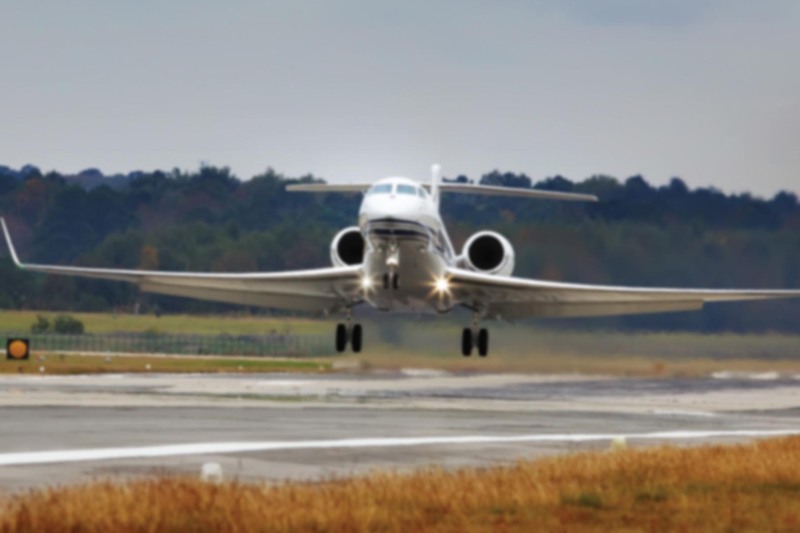 Despite a lousy economy, there’s been some new growth in the aerospace sector. Hawthorne has seen a resurgence in aerospace activity with the success of SpaceX, which is headquartered next to the airport there and employs about 2,000 people there. At the moment they’re America’s best bet for getting humans back to the space station without Russian help. A virtual army of individuals are building GA aircraft under the Experimental/Amateur-Built rules. The number of E-AB aircraft achieving first flights is increasing rapidly, and as I’ve noted previously, they’re even outpacing the commercial OEMs. Airbus recently announced “an effort to forge new partnerships with Southern California manufacturers, with the goal of creating new contracts and new job opportunities for businesses in the region.” That’s just talk, of course, but it beats the usual aerospace-related press releases where “layoffs” and “closures” are frequently mentioned. The UAV sector has been growing by leaps and bounds for quite some time. General Atomics, the 500-pound gorilla in the industry, is a Southern California company and employs something like 10,000 people. And speaking of drones, one of the principal developers of the UAV is a guy named Abe Karem. His company, Karem Aircraft, is headquartered in here in Lake Forest, CA. It’s literally a couple of blocks from my front door. 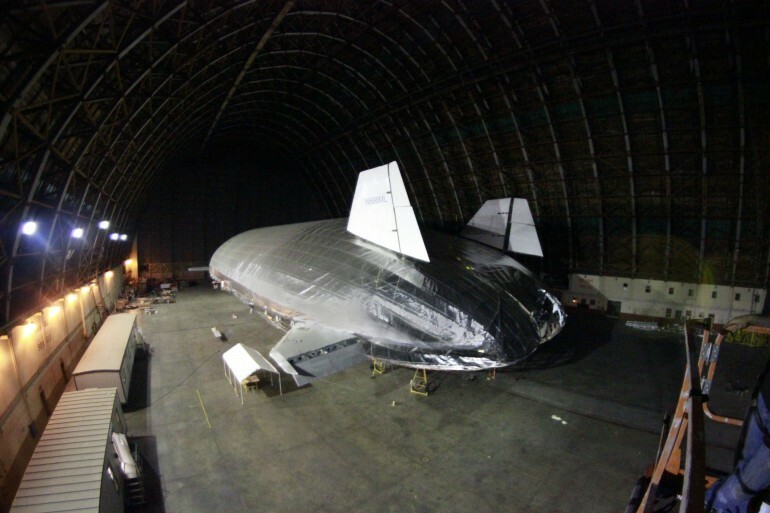 Most recently, at least one of the former MCAS Tustin blimp hangars has been leased to WorldWide Aeros Corp for construction of an intriguing cargo aircraft called the Aeroscraft. 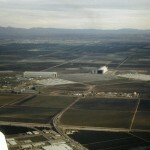 There was a time when the massive Tustin blimp hangars were clearly visible from any point in south or central Orange County. 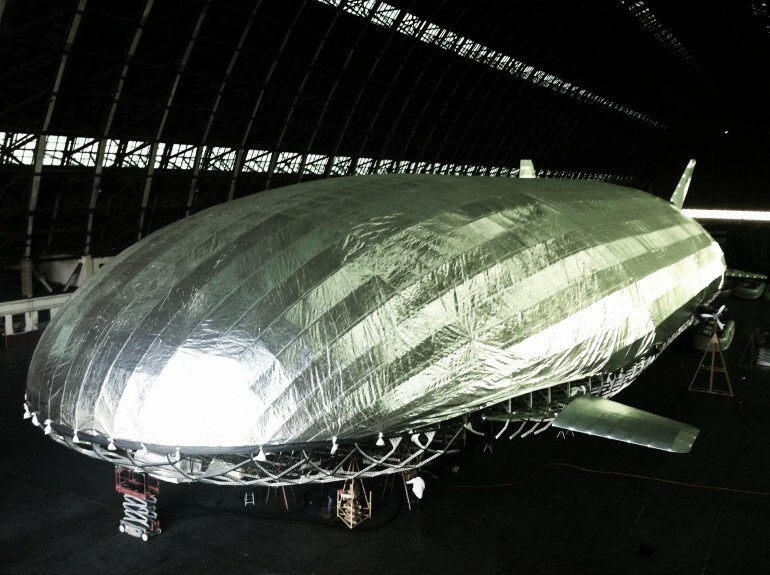 Surrounded by farm land and open space, they were originally constructed to house the helium-filled Lighter-Than-Air craft built for west coast defense during World War II. For more than 70 years they’ve stood above the landscape, their flexible wood superstructure impervious to decades of Santa Ana winds and earthquakes. When the threat of west coast invasion abated, Tustin was reconstituted as a helicopter base for the Marine Corps, and although it closed in 1999, the hangars remain. If they ever build a real-world Star Trek space ship, this may be just about the only space large enough. 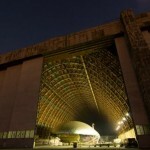 After seeing images of the Aeroscraft inside the north hangar, the structure’s value becomes crystal clear. There are precious few places where something of this size and delicacy could be built. Who knows what ideas aerospace designers will come up with in the future? Some of them are bound to be large. It seems to me that the hangars are worth preserving for that fact alone. South Orange County looked a lot different in 1965! 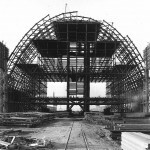 The north hangar under construction in Tustin circa 1943. This hangar is 1,072 feet long and nearly 300 feet wide. It’s also 192 feet tall! 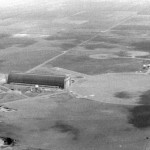 The Tustin LTA base in 1957. Nothing but farm land and open skies! So what does the future portend for aerospace in good old Southern California? Only time will tell. The weather, terrain, remaining infrastructure, and geographic location are certainly appealing. The banana republic regulatory and governmental aspect, not so much. But it occurs to me that it’s darkest just before dawn, so I’m keeping a hopeful outlook. The fat lady hasn’t sung yet… but she’s definitely warmed up and ready to go on.